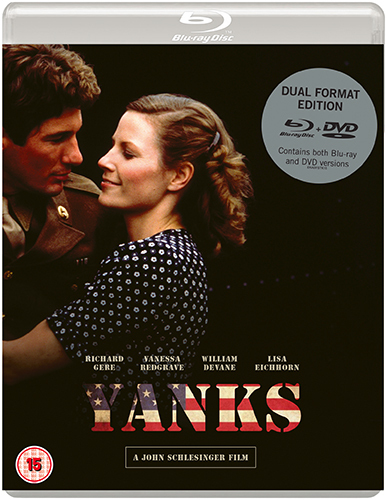 A World War II epic both sweeping and intimate, Yanks is a triumph for director John Schlesinger (Midnight Cowboy, Sunday Bloody Sunday,), and a moving showcase for its splendid ensemble cast led by Richard Gere and Vanessa Redgrave. A war film without battle scenes, Schlesinger’s drama instead focuses on relationships far from the front, examining the romantic entanglements between the stationed U.S. soldiers and the locals in a small town in Northern England in the 1944 period before the Normandy landings. Three very different women find themselves attracted to the American G.I.s at a new military base in town. Gere is Sgt. Matt Dyson, initiating a tentative courtship with a young woman still pining for her fiancee overseas. Redgrave is wealthy socialite Helen, engaged in an affair with a captain (William Devane), while both of them long for their respective spouses far from home. And Sergeant Ruffelo’s fling with Mollie (Wendy Morgan) occurs just as the interactions between the Yanks and their British hosts begin to strain under the tension of the war, and uncertainty about what happens to their new romances. A personal passion project for Schlesinger — who was given free creative reign after the success of Marathon Man (1976) — Yanks was generally not afforded the attention it deserved upon initial release, and as one of the director’s warmest films, it’s a gem ripe for rediscovery.